Our Media Monday wrap is a day late this week due to the Australia Day public holiday. Leading Australian media news, Triple J has responded to viral campaign #Tay4Hottest100 with a Buzzfeed-style post, commercial radio has reported its largest audience ever in 2014, Vevo branches into radio, new data shows print advertising helps sell property, and Fairfax Media partners with top journalism schools. Buzzfeed’s viral campaign to get Taylor Swift’s song, ‘Shake it off’ to the top of Triple J’s Hottest 100 failed yesterday when the station finally announced it had banned the artist. After weeks of social media discussion and enough votes to get the song to number 12, Triple J posted its official statement on the issue less than an hour before the countdown began. 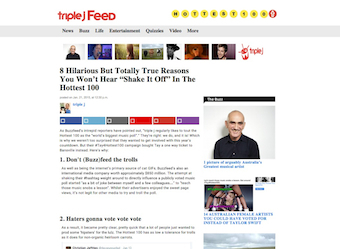 The Buzzfeed-style article sits on a site titled ‘Triple J Feed’, which mimics the design of Buzzfeed, and lists ‘8 Hilarious But Totally True Reasons You Won’t Hear ‘Shake It Off’ In The Hottest 100’. The reasons include that Buzzfeed, which launched the campaign, is a commercial company and that Taylor Swift has never been played on Triple J and was not included in the station’s shortlist. There was also the involvement of another commercial company, KFC, which jumped onto the hashtag, another factors that didn’t sit well with the organisers. Live and local commercial radio attracted 10.1 million weekly listeners during 2014, larger audiences than ever before. The figure was up 4.13% from 2013.
those aged between 25 to 39 and 40 to 54 are the most likely to listen to commercial radio at work. Music video website Vevo has launched into radio for the first time globally in a partnership with Australia’s Today Network. The Today Network will broadcast new show Planet Vevo, hosted by stars Dan and Maz, every Sunday between 2pm and 5pm. “The show will take listeners on a round the world journey via its 14 international studios, providing exclusive content from their favourite artists with exclusive news, interviews and performances,” Authentic Entertainment says. The new show will bring established Vevo properties into radio for the first time. A combination of print and online advertising helps properties sell faster and for higher prices than those advertised in online media alone, according to new research by CoreLogic RP Data. across Australia, homes advertised on both print and online sold an average seven days faster compared with online-only campaigns. Fairfax Media will collaborate with Melbourne’s RMIT University and Queensland University of Technology on their journalism course curriculums. This year, the two universities will offer the unit, ‘Innovation in Modern Journalism’, which “links students with day-to-day newsroom challenges and encourages journalists of the future to find new ways to engage with large audiences who are migrating to modern – in particular, digital – platforms”. Jason Sternberg, QUT head of discipline, journalism, media and communication said the partnership would help students to learn from experienced professionals, while giving the industry access to fresh ideas. “Journalism and higher education are both undergoing significant changes in the way they do business,” he said.